If you haven’t yet been to Dubai, this summer might be a good time to visit. Starting this July, the largest city in the United Arab Emirates will see people traveling across its skies in single-passenger drones. That’s according to Mattar al-Tayer, the chairman and executive director of Dubai’s Roads & Transport Authority (RTA), who announced the plan at the ongoing World Government Summit. He didn’t reveal further details like whether the drones will be up for sale or if a fleet will be available to hire. What we do know is that they are part of Dubai’s strategy to facilitate a quarter of all journeys within the Emirate through autonomous vehicles by 2030. To make this happen, the RTA will employ Chinese firm Ehang’s 184, which is the world’s first passenger drone. It’s capable of a range of about 30 miles on a single charge and can carry one person weighing up to 220 lbs, as well as a small suitcase. The entire flight is managed by a command center; all you need to do is hop in and choose from the list of predetermined destinations where you can land. 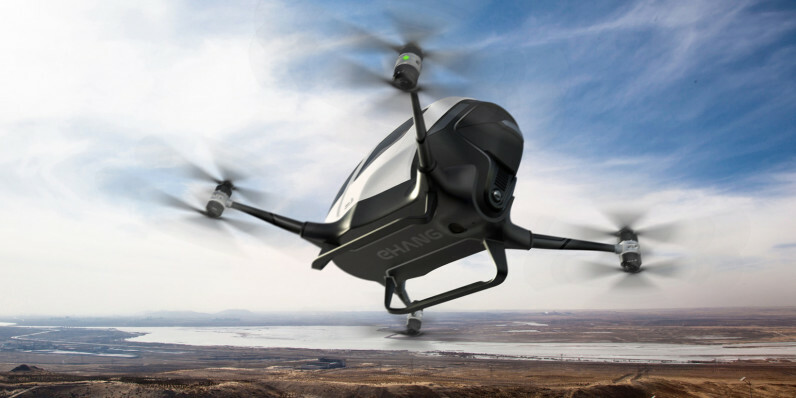 Ehang first showed off its passenger drone last January at CES and received clearance to test the vehicle in Nevada in August 2016. However, the 184 won’t be seen ferrying passengers in the US until it’s cleared for use by the Federal Aviation Authority (FAA).